It can be hard finding one dentist who can see both you and your children. Our general dentists provide dental care for children as well as adults, so your entire family is welcome at our practice. Ellerslie Dental Studio offers children’s dentistry to Ellerslie, Rutherford, Allard, and the surrounding Edmonton neighborhoods. The two most important things about children receiving dental care is getting them used to seeing the dentist and providing extra service to keep their teeth healthy. Getting accustomed to the dentist early in life makes children more likely to keep going to the dentist throughout their adult life, keeping a healthy smile for as long as possible. At our Edmonton general dental practice, we provide dental appointments for children in a way that makes them feel as relaxed as possible when seeing the dentist. We talk to them throughout their basic hygiene services in order to help them understand what a dentist does. This open communication helps most children become more comfortable. We also have TVs in all operatories to serve as a distraction if the patient requires one. However, in the event that your child has dental anxiety that communication and entertainment cannot overcome, Dr. Goswami also has a nitrous oxide certification. He can provide laughing gas at safe levels to help these children receive the care they need. We also understand that healthy baby teeth are important to making sure the adult teeth grow in healthy and strong. To protect the health of a child’s smile, Ellerslie Dental Studio provides fluoride treatments and sealants. Fluoride can strengthen and remineralize the enamel of teeth, making them more resistant to decay. Sealants are thin plastic coatings that prevent food from getting trapped in the grooves of the molars, preventing the growth of decay-causing bacteria on the teeth most susceptible to decay. 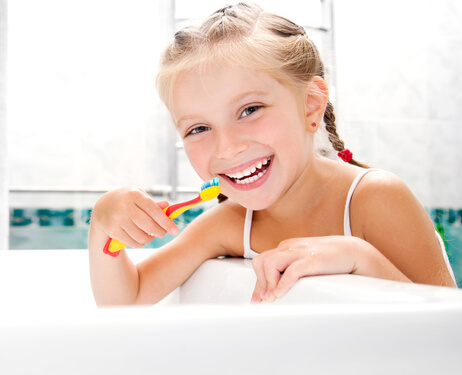 Despite everyone’s best efforts, a child can still develop tooth decay. Our practice can help children restore their smile by adding composite fillings to a tooth with a cavity. Not only do these restorations rebuild the strength and health of the tooth, but their metal-free nature also means that less of the natural tooth has to be removed to add the filling. There is also a cosmetic benefit, as the white resin material is the same color as the natural tooth. Our general dentist is also able to provide a laser frenectomy for children as young as five who are experiencing tongue tie. Also known as ankyloglossia, this condition occurs when the lingual frenulum restricts the tongue’s movement too much, causing difficulty in speaking and eating. The laser procedure safely removes some of this tissue to increase the mobility of the tongue. Ellerslie Dental Studio provides dental care to children in Edmonton, in and near the Ellerslie neighborhood including families in Macewan, Allard, and Rutherford, AB. For more information, call or email us today!